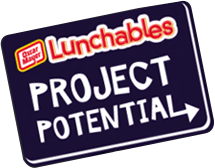 “Field Trips For All” is the first effort from the Lunchables Team’s new initiative called Project Potential. Aimed at empowering kids with opportunities to help them reach their full potential, Project Potential will provide enriching experiences kids might otherwise not have. I remember all the field trips I got to go on, and then the ones my two kids have gone to and they are such wonderful memories! The reason this contest came about is because according to a 2009 report from The American Association of School Administrators, it’s estimated that over the course of the current school year, the number of school districts eliminating field trips will increase by 56 %, that’s more than 30,000 schools! So let's do our part to help and go to http://www.lunchables.com/potential/ and submit a nomination. From all nominations received, 50 classrooms will be selected to go on an inspiring, educational experience. You can also help by spreading the word about this contest....so do it! At the bottom of this post you will see a "share this" button, you can share it on your facebook, twitter, etc. I personally nominated the school, teacher and classroom that my son was a part of when he was in 1st grade. He has great memories and had a wonderful experience with that teacher and that school. OH! And you HAVE to check out this "alien field trip" that an unsuspecting group of 5th graders went on, its adorable!